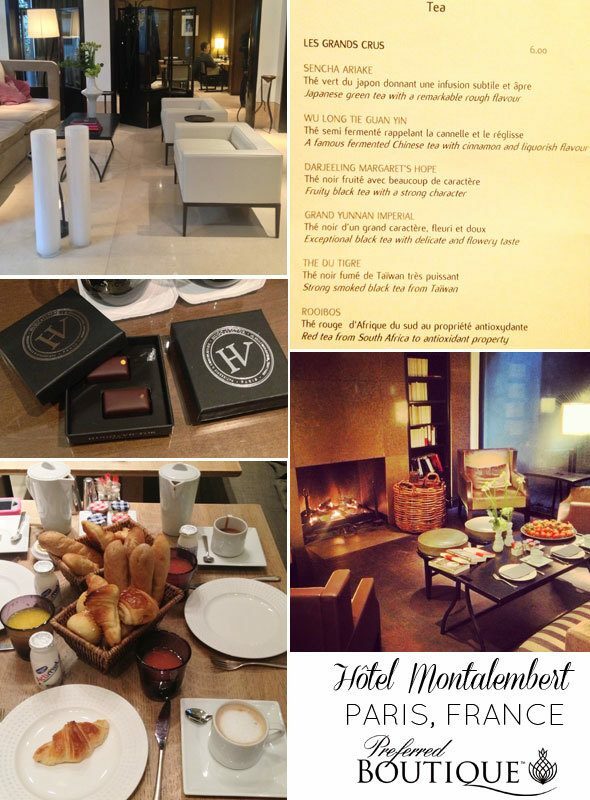 I stayed at the Hôtel Montalembert in Paris, read my review of this five star boutique hotel in the heart of Paris. 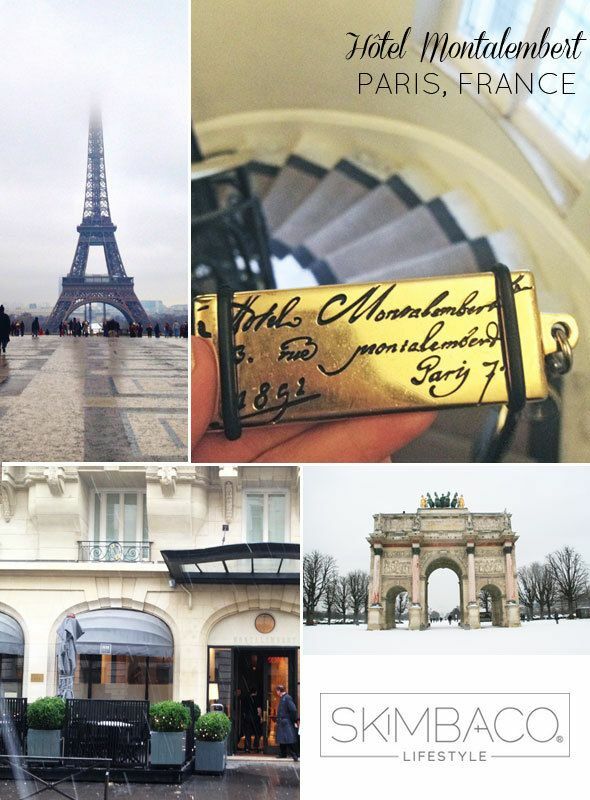 I visited Paris for the first time a few weeks ago during the Paris Fashion Week, and before booking my trip I asked hotel recommendations from the Skimbaco team members who are more familiar with Paris, a few of our team members have even lived in Paris in the past! 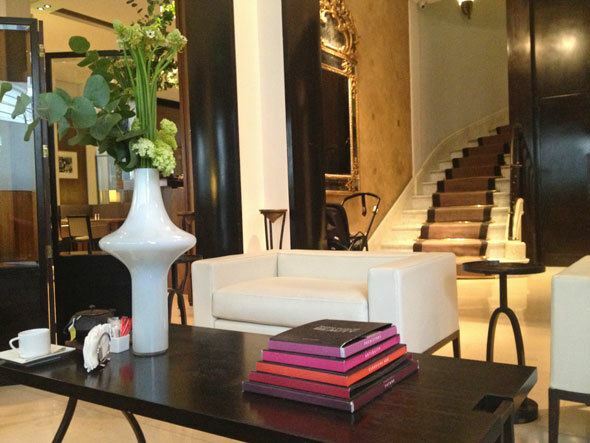 Adrienne said she likes to stay in the Le Marais neighborhood and her favorite Paris hotel, Hôtel Caron de Beaumarchais is there, and Leigh and Nina recommended the Left Bank location in the St. Germain des Pres area of Paris for the easy walking distance to many popular spots in the city. 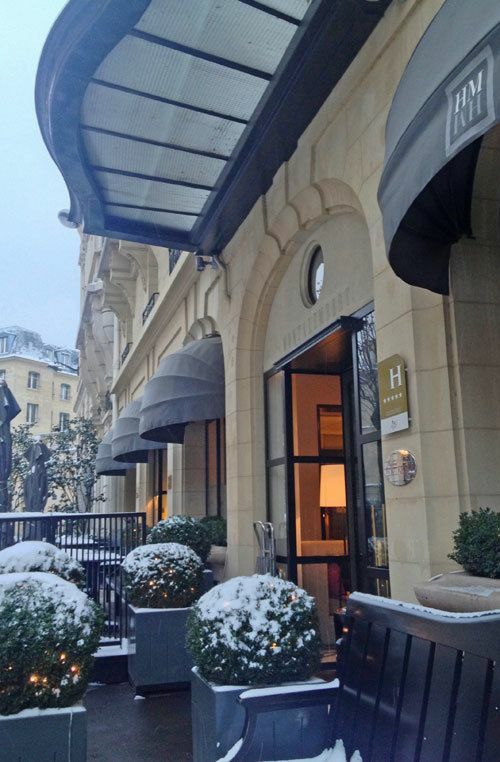 Leigh wrote earlier this winter of her five top boutique hotel picks for this winter season, and among the boutique hotels was the Hôtel Montalembert in Paris, perfectly located on the Left Bank, and I decided to stay there. 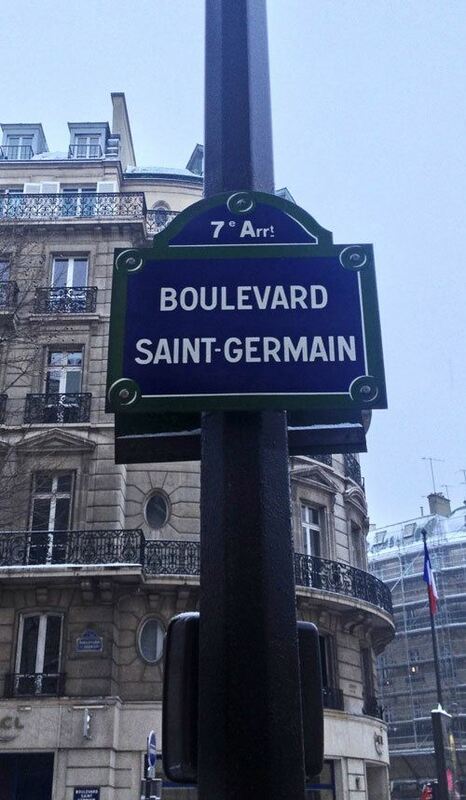 The best about the Hôtel Montalembert really is the Left Bank location in the St. Germain. The St. Germain des Pres district of Paris truly is gorgeous, with stunning architecture and just for walking around soaking in the Parisian ambiance. 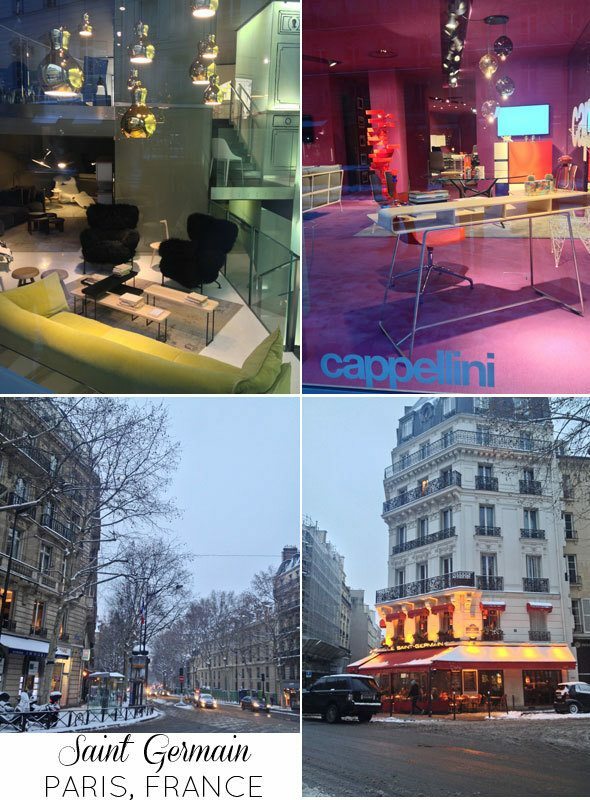 The area is full of amazing design and antique stores, I could have skipped the tourist attractions and just visited the design stores like Cappellini and Kartell for a few days. The area has several small cafes like the Le Saint-Germain, where we ate dinner the first night. Many of the corner cafes in Paris are not your typical American coffee shops, but they are more like a mixture of a pub and a coffee shop, and the bakeries, the pastry shops and the tea houses are a completely different thing. The cafes stay open late and the evenings are more geared towards dinner and wine consumption than coffee. 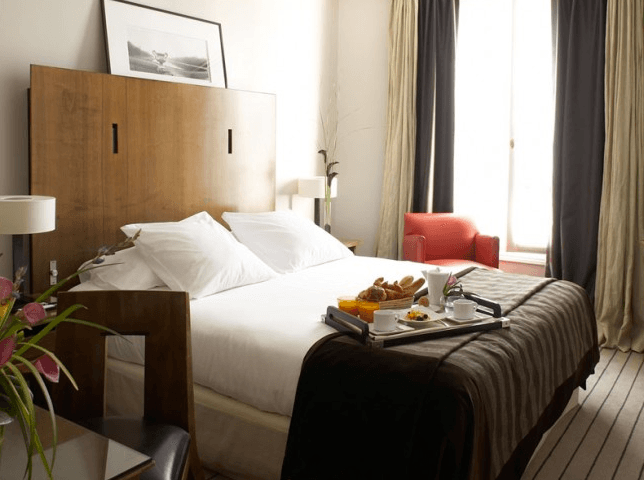 The location of the Hôtel Montalembert is perfect for city sightseeing as well. The Musee D’Orsay is just around the corner and the Louvre museum is a few minute walk away on the other side of the river. We walked to St. Michel and through the Latin Quarter, all the way to Notre Dame and crossed the river to eat dinner at the Le Marais area and see the Hotel De Ville lighted at night, wishing we had had time for ice skating in the front of it. The next day we discovered that also Champs Elysees, Arc de Triomphe Etoile and Eiffel Tower all were on the walking distance in the west side of the Hôtel Montalembert. 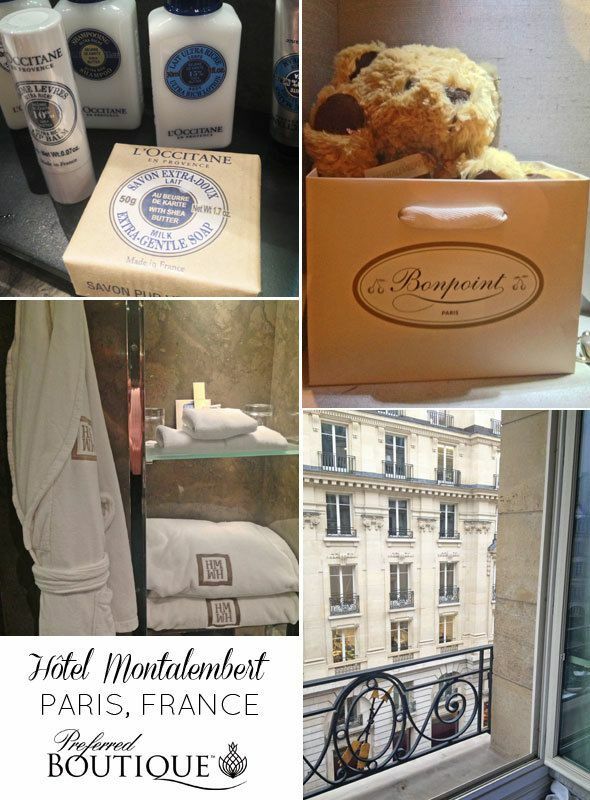 Hôtel Montalembert was built in 1926, and you can still feel the old world charm in this small boutique hotel. There are only 56 rooms and suites, and the feeling is almost intimate. When you get to the hotel you are greeted by a doorman and the hotel staff is very nice to help you with any questions you may have. Our room was shown to us immediately upon our arrival, and we were given the hotel room key in a gorgeous old style key chain, although the key itself was a modern electronic key. We all squeezed into the tiniest old elevator to get us to our floor, and used the gorgeous spiral staircase and walked the stairs the rest of our stay. I have to be honest, it wasn’t quite the same level of luxury as the five star hotels I had stayed in the USA, the room was quite small, but it was expected in Paris. It was also the small things that made it feel less luxurious, like the tiny shower and the lack of outlets where to plug your laptop and phone charger in the room. 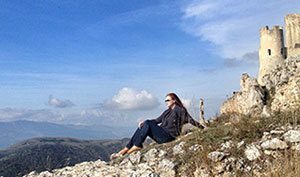 At the same time it was the small things that made it feel luxurious, like the L’Occitane lotions, shampoos and other toiletries, and the VOSS water waiting for you when you arrived after a day of sightseeing in Paris. The sheets in the beds were nice thick cotton, and the room voiced simple elegance making me feel at home. 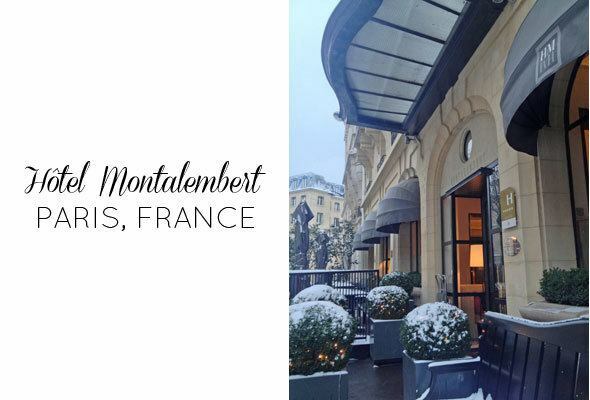 Hôtel Montalembert is part of the Prefered Hotel Group’s Preferred Boutique brand, and it reflects sophistication and customer service you’d expect from the brand. The atmosphere at the Hôtel Montalembert is very contemporary cosmopolitan, you truly feel like you are in Paris when opening the large windows in the room and eating croissants for breakfast, yet the old world Parisian charm was nicely balanced with modern furniture and more contemporary feeling with framed photo art and contemporary furniture. The hotel was re-decorated by famous interior designer Christian Liaigre a few years ago and I love how the old world charm was kept while making the hotel very modern. If you follow me on Instagram, you know I start every morning by posting a “good morning from…” photo. 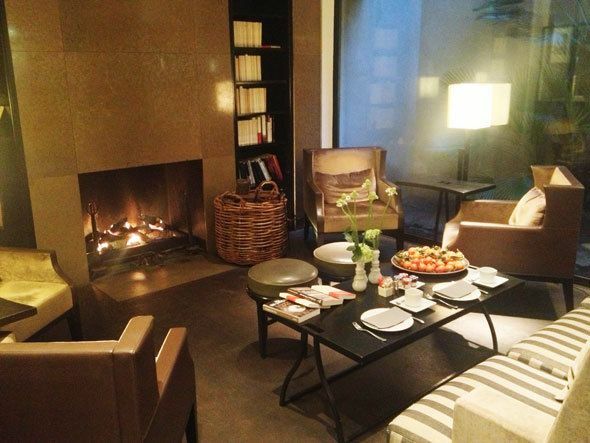 Most often it is just from Sweden where I live, but I truly enjoyed starting my morning at the Hôtel Montalembert and posting my Good Morning from Paris pictures of the breakfast spread of the continental breakfast that included croissants, pastries, bread with butter and Bonne Maman jam and freshly squeezed grapefruit or orange juice and coffee or tea. It was the perfect way to start the day. 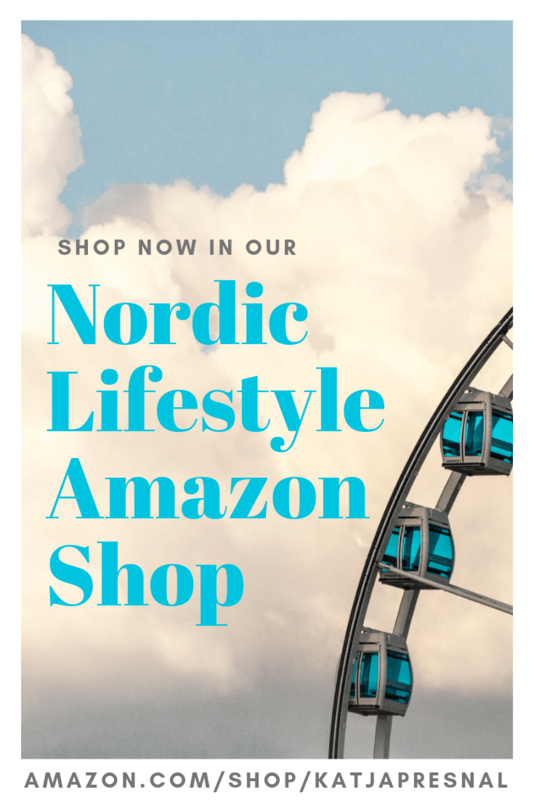 I actually feel relaxed and cozy after reading this. One day, Paris. What a heavenly place! I’ve only been to Paris once, long ago, and it was a less-than-desirable situation. I’d love to go back and really enjoy it properly! Stunning! And everything I would expect Paris to be. Packing my bags.